Yeah, but: Now I can't imagine having a phone without a keyboard. The Long Version: There's already plenty of technical and feature-by-feature reviews of the BlackBerry Bold, as well as many forums that are dedicated to it. Instead of trying to replicate their efforts, this review is just my collection of personal observations. First of all, a reality check: Yes, its nickname is 'crackberry', and yes, I do start to feel panicky and a little lost when mine is out of easy reach. But remember that it started its life as an overgrown alphanumeric pager that was the size of a block of soap. A large block of soap. (I remind mine of that to keep it humble.) Any addictive powers are the fault of the user, not because the device is completely life-changing. So if the internet and e-mail is something you can happily forget about for days, this is no big deal. But if being connected is feeding some deeper need, watch out. When it came time for me to choose a Smartphone, the obvious contenders were something from Research In Motion or Apple. • BlackBerries evolved from a corporate tool, and still have a 'Business' connotation; iPhones are MP3 players with groovy touchscreens. Maybe older or hipper people can pull off an iPhone in a business setting, but I look young for my age, and pulling out an iPhone in front of a client would make me look like a n00b. • The screen sizes are different, but the screen resolution is the same for the Bold and the iPhone. • It has a keyboard. I've never liked touch-screens, as I prefer my buttons to stay in one place. I have to be honest and say that I never even looked at an iPhone when it came time to buy. I think I have a pretty good idea of their strengths, and have used one briefly, and it just wasn't for me. Ontario has only three real cell-phone companies: Rogers, Telus, Bell, and Virgin. When shopping between them I got the same feeling that I get when I'm dealing with banks: it's fundamentally expensive, everything costs extra, and there's nothing I can do about it. (Note that Canadian banks haven't been imploding recently, and world events make me begrudge them their multi-billion dollar profits much less. That means that I actually like banks better than telecommunications companies.) Occasionally a newspaper or consumer-advocacy group points out how expensive our cell-phone plans are, especially data rates. While the plan that I'm on with my new BlackBerry is expensive, it's only half-again what my old phone cost, which makes it a relative bargain. What's not discussed is the price of the devices themselves. For the 'regular' price of a new Bold, I could walk into one of the big-box electronics retailers and walk out with a 15" laptop. Sure, it would run Windows, but it would still be a full-fledged computer. Can anyone tell me honestly that the price of a phone without a multi-year service contract isn't meant to be punitive? When I was a kid, we had a Commodore 64 computer. One of my favourite games was called "M.U.L.E. ", which I loved for the opening theme. (This is what state-of-the-art looked like twenty-five years ago.) One of the first things I did with my new Bold was copy over the MP3 of it and set it up as a ring tone. I know nothing about this sort of thing, but it was easy. I use a Mac, and the software that RIM provides is pretty basic. As a consequence, it's much more limited as a business tool, and more importantly, it doesn't sync with iTunes. Apparently there's other software that's better, but I haven't tried it out. It would be nice to have a replacement for my iPod, but the Bold just isn't up to the task even if I was able to get all of my playlists moved over. The controls just aren't as good as the ones on my Nano. The GPS function is something that I was really looking forward to, and it hasn't been a disappointment. The provided mapping software is decent, and can show my direction and speed. But there's also this thing called Google Maps, and it's a free download. It let me track where I was using satellite imagery when I was out on a roving photo shoot a few weekends ago, something that the car-based units couldn't do. It didn't improve my photos, but it was cool and made for a prettier drive. I'm currently addicted to playing Freecell, which I downloaded after I grew tired of the game of Klondike that comes pre-installed. The Bold has really nice graphics and a decent processor, so it does better than most computers did a mere fifteen years ago. The security features of the Bold is one of the things that annoys me. It can be set to require a password after it's been idle, but the longest time-out is an hour. All I want is for it to be unusable if I lose it, so locking after four or six hours would be plenty. Also, if I hit the space bar (or any other letter key) to wake up the phone, it enters it as the start of the password - so I typically need to delete it before actually typing the password, increasing the hassle of process. Security needs to be used to be effective, and it needs to be easy to be used - there's a fine balance that RIM has missed on this one. Hitting a key when the phone is sleeping (that is, when the screen is off) but not locked simply wakes the phone, so going to an application or using a speed-dial number takes two button presses. That's fine, but it's not how it behaves if the phone is locked, and the two states - LCD off but not password protected, LCD off and password protected - look identical. The fastest way to annoy me is to have a button or a device behave differently in different contexts, especially when there's no way to know which to expect. Browsing the web on the Bold is pretty good. It can't handle Flash, which is unfortunate but not uncommon. (It does mean that I can't format a review or upload photos to blogger directly from my phone, putting an end to my live-blogging review dreams.) I also find that I prefer 'Column View' for just about every page I visit, but there's no way to set that as a default in the built-in browser. I've often read comments that Opera Mini is a much better browser, but I personally haven't found it easier or faster. That may indicate more about my level of sophistication than either web browser, but so far I don't see any compelling reason to not use the BlackBerry's own browser. E-mail is what BlackBerries live for. If I send an e-mail with either my POP or gmail accounts, I'll have a copy on my phone as soon as the 'sent' confirmation pops up on my computer. Setting it up to use my different e-mail accounts - six of them - was as easy as setting them up on my computer, although it does take some acrobatics to get rid of the "sent from a blackberry on the parasitic advertising (replace with carrier name) network" that can't be done from the handset. My only other problem was that there has been one period of slow mail delivery, which left me feeling panicky and a little lost. I've downloaded an applet that lets me automatically check the weather conditions and forecast. This means that I can actually know what to wear before I need to make that decision - which may sound simple, but it's the biggest thing that I've missed since I started waking up to my cell phone instead of a clock radio all those years ago. The big advantage of the cell-phone alarm is that it will go off even during a power failure, and I'm a big fan of reliability in my life-assistance devices. "Bold" is a dumb name for an overgrown alphanumeric pager. When I was doing my pre-purchase research, I found that the bits of the reviews marked "sound quality" typically talked about the speakerphone and music. For use as an actual telephone, the sound from the earpiece is pretty good, and much better than the MotoRazr that I endured for so long. The other person's not quite so lucky, because the microphone is at the bottom-right corner, which usually lines up with the middle of my cheek. It picks up a lot of environmental noise, and I need to talk more loudly, which has always annoyed me when I'm around other people who are using BlackBerries. The other charming habit that BlackBerry users have is keeping their heads buried in their screens while they walk. There seems to be some fundamental incompatibility between typing and walking in a straight line. Yes, I have one, but no, I don't do this, and no, I'm not going to accept full responsibility for your collision-free journey. Look where you're going, and if you need to check an address or your current GPS position, get out of everyone else's way first. The Bold is able to use a WiFi connection for data, but not for voice calls. I can't really say that I notice much difference in speed between my home broadband and the mobile 3G for the sites that I visit, which means that the performance bottleneck is in the device, not the network. (The 'EDGE' network is noticeably slower.) It's pretty fast, but larger pages like Conscientious or The Online Photographer do take a while to load. We're still at the point where the fact that the dog can talk is amazing, regardless of what it says: I'm okay with it being a little slow to load a satellite image and mark my exact position on it when I'm standing on a dirt road in the middle of nowhere. I've never been able to touch-type, but I've gotten so good at the hunt-and-peck method that I'm pretty quick and can actually do it (briefly) without looking at the keyboard. Typing on the Bold is taking a little adjustment - mostly with uppercase and punctuation - but I've been astonished at how completely it has devastated my ability to type on my two Macintosh keyboards. I recently used the supplied charger for the first time, even though I've now owned the device for two months. It's not that the battery life is that great - I usually charge it every night, but can go for two days without it running out of power - but it uses a USB charger, which I already had plugged in for my old phone. In fact, I have four different USB chargers scattered around the house, including 12V/car plugs, and my iPod chargers with the ability to take a standard or iPod compatible cable. This means that when I travel, my iPod, Hyperdrive storage device, and Blackberry can all use the same charger. I love standardization. The USB plug on the RIM charger made me laugh, though. It's helpfully labeled "UP" to show which side faces up when it's being plugged in: nice. But there's also an arrow pointing at the connector: dumb. Did they have problems with people stuffing the wire into the USB port? Or does it mean that the charger should only be plugged in vertically, with the blackberry resting on its edge? I have to assume that nobody actually tries to do that, so there's no harm done aside from giving me something to laugh at. It's a win all around. 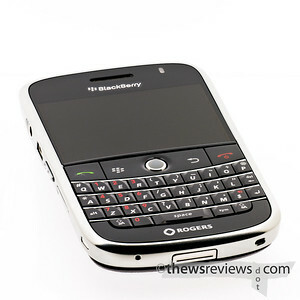 I bought the official BlackBerry silicone skin for my 9000, which comes in a set with one black and one white. I like it better than the (cheaper) generic ones, and it has a better fit. This may be the subject for its own review in the future. While I may have some quibbles with my BB Bold, overall I'm really impressed. Now I can't imagine having a phone without a keyboard.